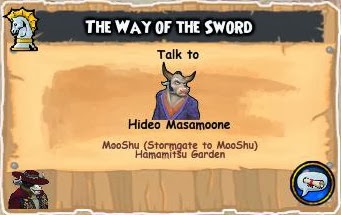 Once El Toro reaches Level 40, he tells you that he would like to become a Master of the Sword, and we should head to Mooshu to and speak to Hideo Masamoone who then tells you that; Moosashi Mooyamoto is the Master Swordman of Mooshu, and he will teach you if you are willing. When you speak to Mooshashi, there is a fight with him so he can determine if you are worthy enough of his teachings. After defeating him, he confirms that you are, in fact, worthy of his teaching and he tells you to go catch a fish and then speak to Moofune. 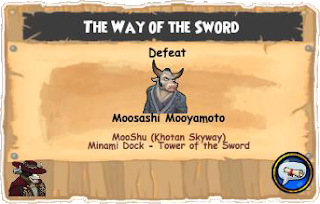 Moofune is a way for Moosashi to "teach" you by learning the art of "Stillness". Once defeating Moofune, you return to Moosashi and he tells you that you have learnt the art of Stillness, now you must learn the art of Power. To do this, you must cut down a Yum-Yum tree with a butter knife, and then to speak to Mooyaguchi. 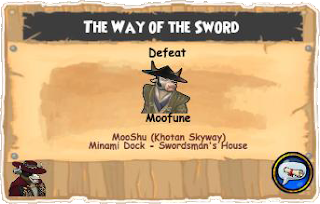 The Yum-Yum Tree challange failed, in fact, El Toro breaks the knife and announces that he has too much power and that he should just go speak to Mooyaguchi. Mooyaguchi, once again is a way for Moosashi to "teach" you and a battle ensues. 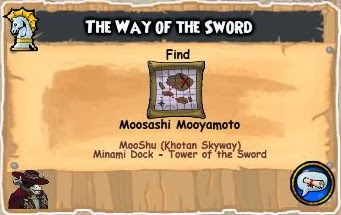 Mooyaguchi tells you to return to Moosashi to complete your lesson. To complete your lessons, you must defeat Moosashi (again) and proove your worthiness. 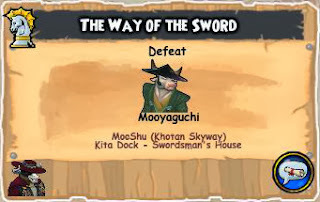 After you defeat him, you prove your worthiness and Moosashi approves of your Swordsmanship. 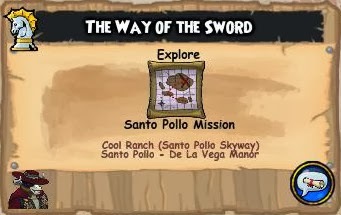 El Toro has something that he left in his mansion in Santa Pollo, what could it be? It turns out it's a new uniform! Speak to El Toro in a Tavern Cellar to Promote him.